The country’s seasons, state support, and education system impact how parents splash the cash on their little darlings. The amount of money parents spend on their kids differs in Russia depending on salaries and number of other factors. Some prefer to invest in education, while others try to raise sports champions. In Russia, there’s no official research on parents’ spending on kids, but according to some polls families are most likely to fork out on educating their children as opposed holidays. So how much does it cost to raise kids in Russia? 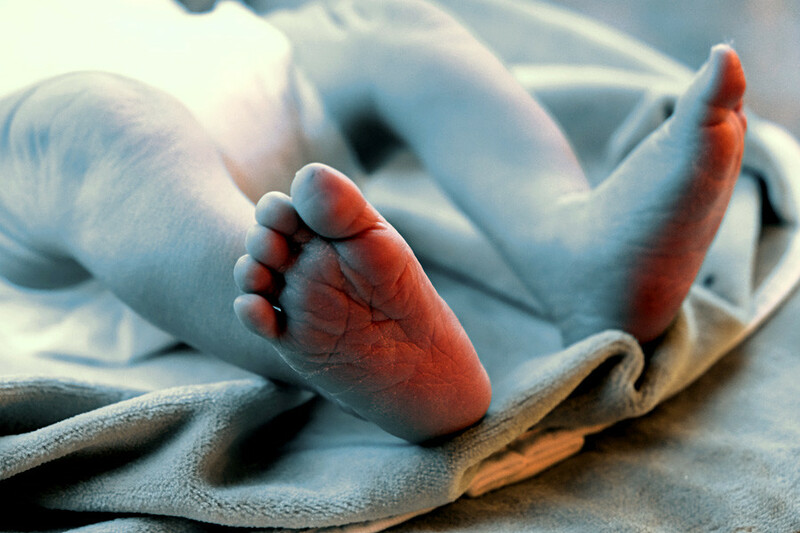 Parents witness a baby-sized hole in their wallets right after the child is born: A baby carriage, clothes, cosmetics for bathing and hygiene, and more are needed. The price for such things depends on the brand and the size of one’s bank account. For example, a baby carriage usually costs anywhere from 10,000 rubles ($170) but many people buy second-hand baby equipment to save money. In Moscow, mothers are given free clothes, cosmetics, bed linen, and a thermometer for their baby. All Russians, including children, have an obligatory medical insurance policy so they can get medical assistance for free or at reduced rates. But as kids often fall ill, parents need to spend money on medicine. For example, when a kid catches a cold one visit to a pharmacy costs on average about 1,000 rubles ($17). Some parents use private healthcare assistance and the price depends on the company. A girl at Kindergarten No. 406, Moscow. Parents can take their kid to a state kindergarten from the age of three, but they normally have to wait in a queue for a long time when they sign up. The payment for kindergarten depends on the region. Mother of two Tatyana Rusakova from the Moscow Region says she pays 3,000 rubles ($50) on school fees for her toddler every month. 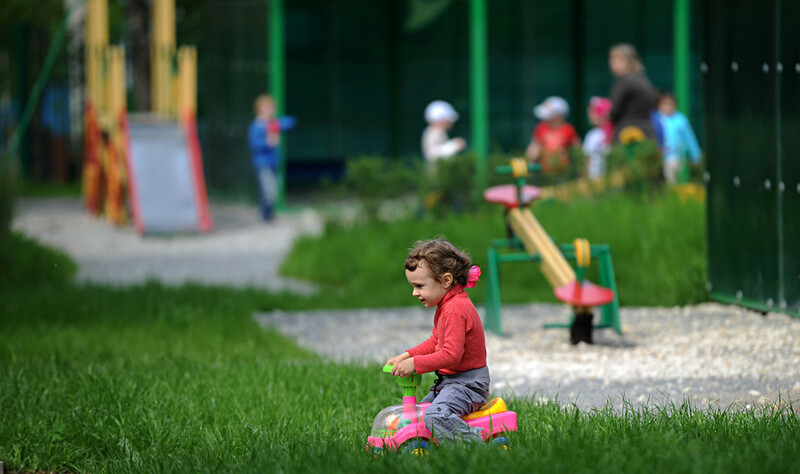 Maria Zagryadskaya, a mother of two small daughters, says she pays about 2,400 rubles for a state kindergarten in Moscow, but some lessons are not included. For example, drawing classes cost 1,500 rubles ($25) a month. Moreover, she pays “donations” to the kindergarten - about 9,000 rubles ($155) every year. Tatyana pays about 4,000 rubles ($70) as a donation each year. If parents cannot wait or would like their child to start kindergarten earlier, they can choose a private one. The average price starts from 25,000 rubles ($430) a month in Moscow. Another option is to hire a nanny – from 300 rubles ($5) per hour in Moscow and from 150 ($2.5) rubles per hour in other regions. According to ROMIR (March 2018), only one percent of Russian families employ a nanny, while 10 to 15 percent ask grandparents to babysit. The Russian Constitution guarantees free secondary education for children, so the vast majority of kids study in free state schools. Only 0.7 percent of children visit private schools and the same quantity is homeschooled. But still, schools can drain a family’s budget. According to a poll conducted by the Russian Public Opinion Research Center in 2017, the average Russian family spends 12,745 rubles ($220) just to prepare a child for school. Half of this sum is spent on clothing and shoes, 1,700 rubles ($30) – for bags, the same for writing goods, 1,200 rubles ($20) for study books, 1,000 rubles ($17) towards school fees, and about 600 rubles ($10) for teachers’ gifts (in Russia, kids usually present flowers on Sept. 1). Many Russian families pay school donations, the so-called “sum for curtains” amounting to several thousands of rubles a year. 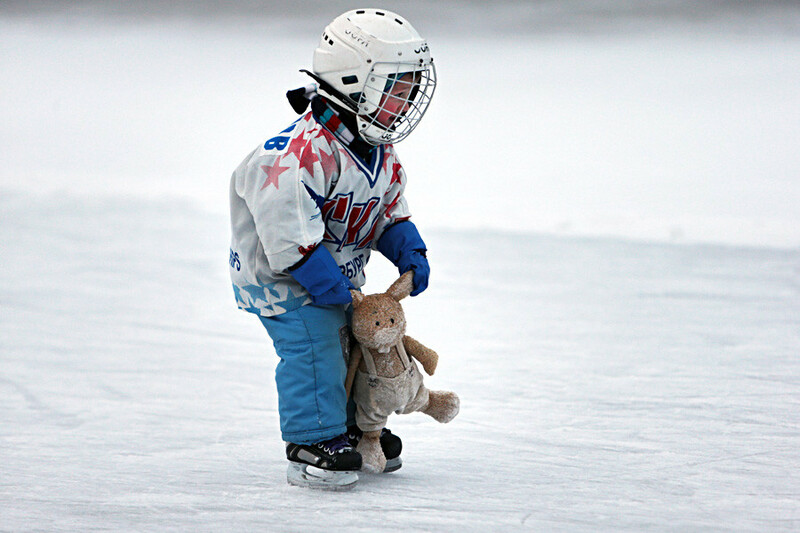 A young boy skating on an outdoor rink in St. Petersburg. In Russia, supplementary education for children is a very popular issue. In Soviet times, there was a state system of free extra classes for kids, and many parents who remember aviation modeling and sports clubs usually find hobbies for their children. However, they now have to pay for it. Tatyana pays about 6,000 rubles ($100) every month for taekwondo and football classes for her son. Her 11-year-old daughter is very keen on biathlon, that’s why they need to buy professional equipment (about 50,000 rubles [$860] every year) and pay for sports gatherings (100,000 rubles [$1,700] every year). The payment for her Spanish courses and biathlon classes is only 8,000 rubles ($140) monthly. 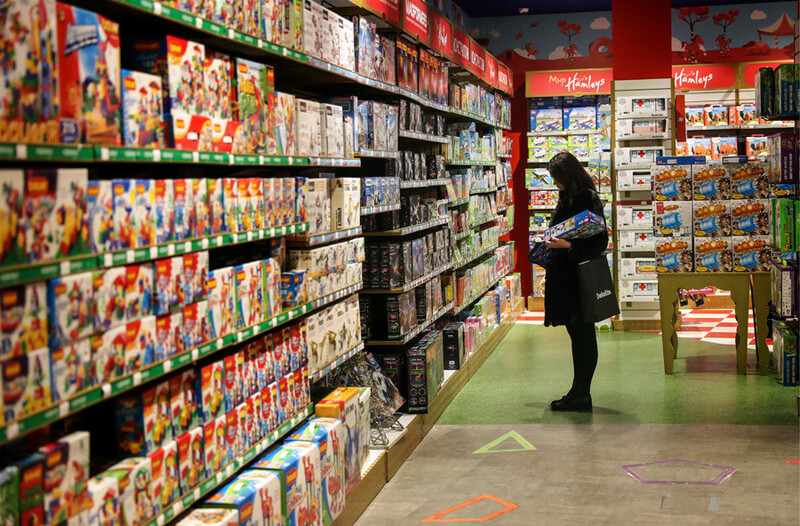 A woman shopping at the Central Children's Store in Moscow's Lubyanka Square. Tatyana spends about 2,000 rubles ($35) a month for her son’s toys, while her daughter prefers to play with her smartphone and notebook (that once belonged to her parents). She doesn’t give any pocket money to her children and prefers to spend vacations at their dacha. Maria says she barely spends money on toys but sometimes goes to the children’s theater where one ticket costs from 500 rubles ($9), and to amusement parks in Moscow (the same price for one). In contrast to entertainment, children clothes are rather expensive. Tatyana spends about 20,000 rubles ($350) for her two children a year, while Maria spends about 30,000 rubles ($520) on each of her girls per annum. Children grow very fast and in Russia you need to have a lot of clothes for the different seasons, from the super hot summer to the severe winter. Many parents buy used clothes via the internet. Meanwhile, Rosstat noticed that about 18 percent of children live in families with a low income. 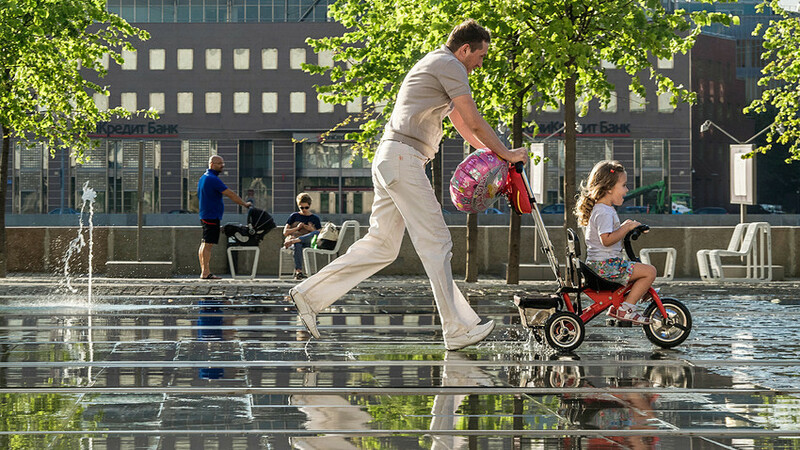 According to the service, 48 percent of children don’t take part in school trips and 31 percent don’t have sports equipment (bike, roller skates, etc) because their parents cannot afford it. http://www.gks.ru/publish/prezent/infograf/children_russia.pdf Nevertheless, 9 out of 10 Russian children have a lot of books at home. 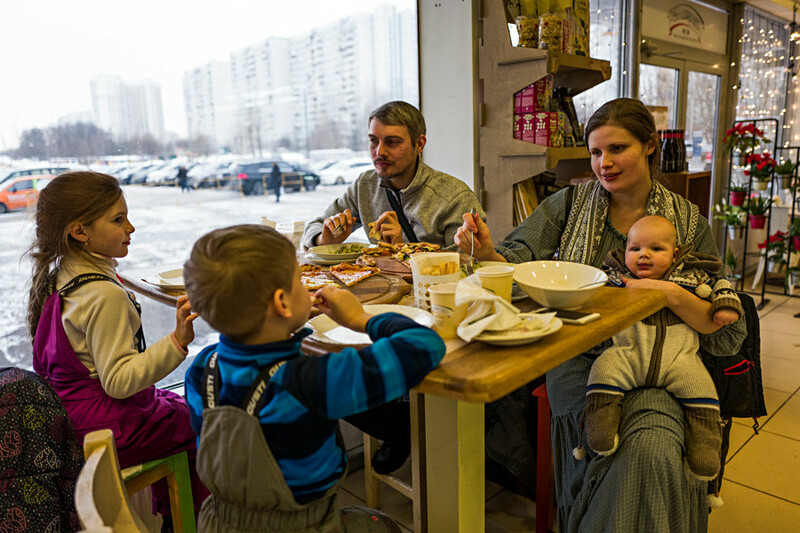 A Moscow's family eats in the cafe. Children normally need special food bought for them. For example, Maria spends at least 3,000 rubles ($50) only for kids’ dairy food. Tatyana drops an even larger sum – 5,000 rubles ($85) a month. A family walk inside the Kremlin with the Ivan the Great Bell Tower in the background, in Moscow. Is there any state support? Yes, but mostly in the early years of maternity. During pregnancy a woman gets a lump sum allowance calculated from her salary (from 34,000 rubles [$600] to 290,000 rubles [$5,100]). After the children’s birth, the state will pay a monthly allowance during the first 1.5 years. These calculations are based on the mother’s salary (from 3,000 rubles [$50] to 24,000 rubles [$420]). A woman can stay at home for the first three years of a child’s life, but many return to work early. Fathers can also take “maternity leave” but only two percent in Russia do. After the birth of the second child a mother is paid about 450,000 rubles ($8,000) – this so-called "maternity capital" that can be spent on the children’s housing and education. If a woman has a third baby she receives benefits like free public transport and additional vacations. Moreover, many Russian banks allow mortgages and special offers on credits for families with several children. 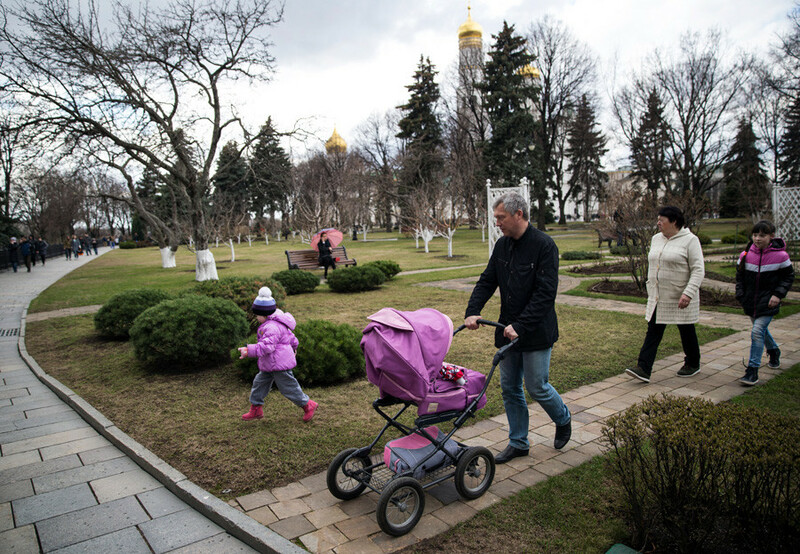 A family walk near the train station in the eastern Russian city of Vladivostok. The average Russian family consists of two parents and two children. According to Rosstat, a Russian woman gives birth to 1.7 kids. About 230,000 families in Russia raise four children, and about 100,000 parents raise five and more. The average family’s income in 2017 was 71,800 rubles, or $1250 (data by ROMIR, May 2017).